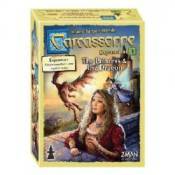 Fantasy is introduced into the land of Carcassonne with this third expansion Princess & The Dragon. An imposing dragon is flying over Carcassonne and its surroundings, scaring followers away. Heroes and adventurers are doing all they can to resist the dragon�s assaults, but it is all for naught without the fairy�s assistance. Meanwhile, the princess is recruiting knights for her personal guard. While they are busy laboring their fields, farmers stumble upon magical portals that lead to unexplored areas, which are hopefully out of the dragon�s reach. Each tile from this expansion is marked with a special icon, allowing you to sort these tiles more quickly.